In his book 50 Ways to Create Great Relationships, Steve Chandler admits that it took him a long time to let that sink in. Love acts like love would act. It doesn't act some other part. In our ordinary lives, we know this. We can spot a young couple in love a mile away. We can spot it in the old couple who are still genuinely fond of each other. We can do this because love acts the part. We can even spot this love in people long dead -- through their photographs. One reason I get such a kick out of photos of old-time radio comedian Fred Allen and his wife Portland Hoffa is that you can just tell they're still in love, many years after their wedding. And you can tell this in the recordings of their long-ago radio broadcasts. Their affection for each other almost literally leaps out at you from the speakers in the radio. You can tell this because love always acts the part. You can tell the love in life's tougher situations, too. Love takes care of you when you are sick. It visits you in the hospital. It comes to the funeral when your loved one dies. Love doesn't forget to call. It doesn't forget to visit. Because love always acts the part. It doesn't act some other part. If someone says "I'm sorry I never visited you when you were in the hospital for 6 months, but I still love you. ", you know it's not true, because that's not how love would act. The not-coming-by-for-6-months is a different part, one that love doesn't act. In that long-ago summer before 9/11 Jessie Arbogast was in the news because he was saved from a shark attack by his uncle. But unfortunately Jessie lost so much blood that he suffered a brain injury similar to our son Ryan. That's a picture taken in 2004 of Jessie with his parents David and Claire Arbogast. David Arbogast gave up his job as a tile setter three years ago and became Jessie's full-time caregiver. 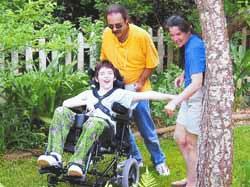 They take care of him at home and Jessie interacts with his brothers and sisters with smiles and laughter. Love Acts The Part. Love takes care of you, even when it isn't easy. Love is there for you, even when all seems hopeless. And when it gets knocked down, love picks itself off the ground and carries itself with as much grace and dignity as it can muster. And love doesn't act some other part. It doesn't win money for your care, then try to keep it for itself. It doesn't abandon you. It doesn't run off with someone else. And of course, it certainly doesn't starve you to death. It wouldn't think of denying you water until you died a slow, slow painful death of dehydration. And love wouldn't make your grave marker a grotesque monument to its own ego. That's all acting out some other part, but that part isn't love. Because what is true is true always: Love Acts The Part. UPDATE 6/30/2005: Charlie Sykes of WTMJ radio in Milwaukee read part of this post on his morning show to-day. Thanks, Charlie! I think love has different levels,degrees and depth. As we grow older together, As we continue to change with age, There is a very important factor that will never change. "Absence helps to make the heart grow fonder" What It Really Means. It's an awesome article in support of all the internet viewers; they will take advantage from it I am sure. If I could figure out how to do the trackback, it would show how much I appreciate this piece, Tom McMahon! You are right ON. God bless!. Great post. This also has advice for young people thinking about marriage: you can tell if someone loves you by their actions more than their words. 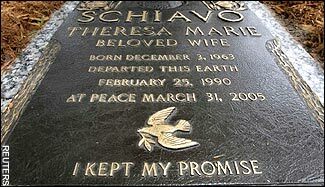 Maybe Terri Schiavo may have had similar warnings. Buildings are expensive and not everybody can buy it. However, personal loans are created to support different people in such kind of cases. If I could figure out how to do the trackback, it would show how much I appreciate this piece, Tom McMahon! You are right ON. God bless! One thing about the tombstone is true, anyway. She did keep her promise. Love, honor, and cherish. Too bad she was the only one.